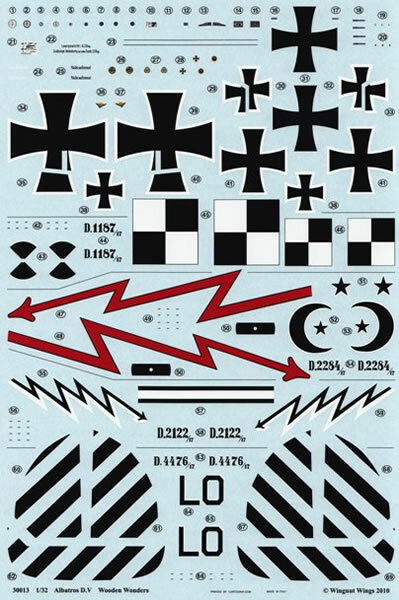 Each set contains decals and full colour instructions. 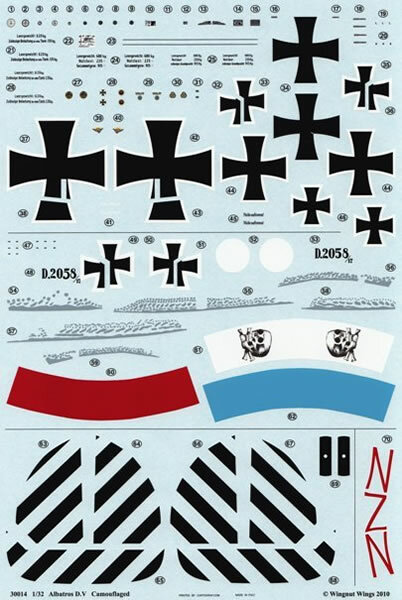 Diverse range of well researched subjects, superb artwork with accompanying reference photos; optional parts listed from donor kit where needed; decals in perfect register with a minimal amount of surrounding carrier film; the inclusion of instrument faces, logos, and stencil data. A quartet of very comprehensive sheets from Wingnut Wings. They supply more than just the relevant national and personal markings, so there’s plenty left over for the spares box. The level of research means that each subject can be tackled with confidence and the diverse assortment of schemes is also pleasing. Some of the options presented here have “lozenge”covered wings. For reasons of economy, this material is not included in these releases but is available separately from this manufacturer. 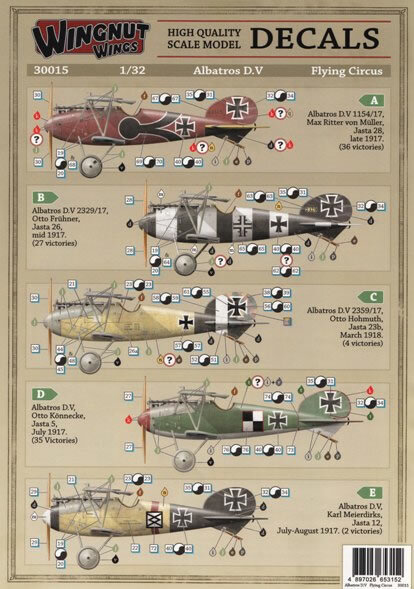 The Albatros series of fighters are some of the most colourful in the German Air Service. 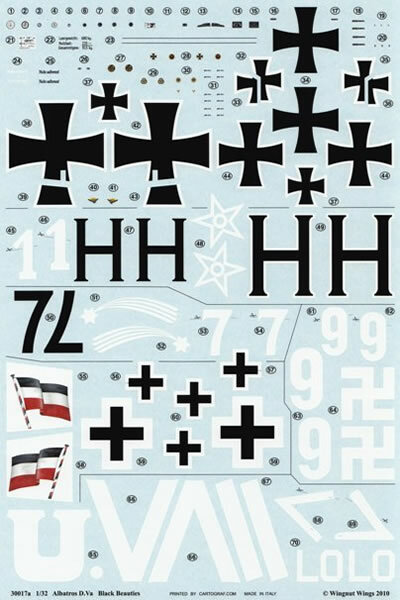 As such, the combination of Jasta and personal markings make them a firm favourite for decal manufacturers. When Wingnut Wings released their kits of both the D.V and D.Va, they also promised a range of livery for these aircraft and we haven’t been disappointed. Following on from their previous releases, this quartet also follows a theme. “Wooden Wonders” (#30013) represents aircraft that had the majority of their fuselages retaining the natural wood colour of the underlying ply. “Camouflaged” (#30014) caters for the machines that were predominantly finished in schemes that were vastly different from those of “factory fresh” examples. “Flying Circus” (#30015) is for those fighters that wore a particularly colourful combination of colours and “Black Beauties” (#30017) refers to Jastas 37 and 62 who didn’t mind identifying their steeds with black fuselages. Each comes on an A4 sized sheet of decal paper (plus a smaller leaf for #30017) and is printed by Cartograf in Italy. As such the quality is up to the high standard found in the kits themselves. Every item is printed with perfect colour registration and is surrounded by a minimum of carrier film. A huge bonus with these sheets is the sheer number of extra items to be found. Not only do we get the usual national and personal markings but we also get a wealth of stencil data. Included in this lot are instrument dials, propeller logos, data plates, datum lines, rigging diagram, weight tables and much more. It’s all legible under a magnifying glass which is a credit to the printers. 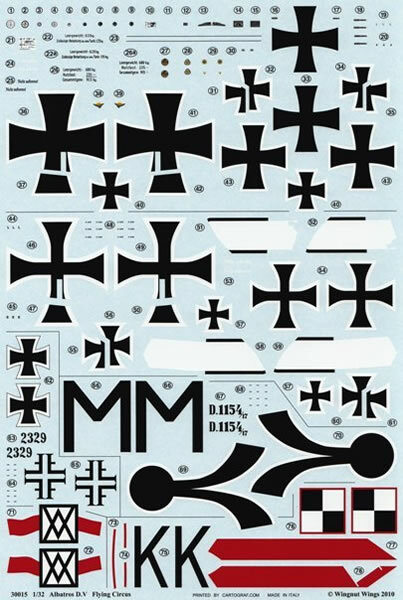 The instruction sheet is very comprehensive and clearly lets you know where each decal should go. Ronny Bar’s superb artwork takes care of side, upper and lower views and is complimented by period photos of the subject under consideration. Another highly commendable aspect is the callout for optional parts that should be used from the donor kit. No second guessing needed by the builder here. Fuselage – natural wood, Wings – mauve and green upper surfaces with light blue undersides. 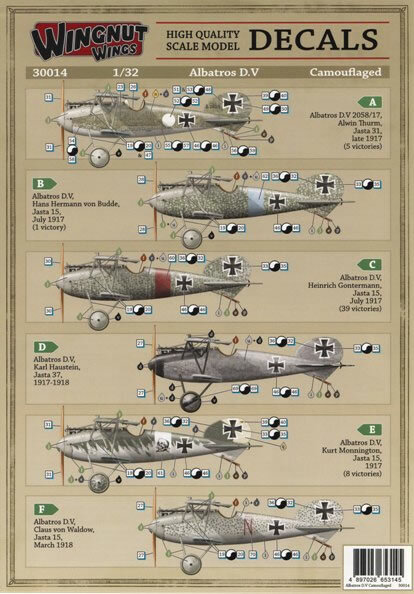 Albatros D.V, serial 2122/17, “Lightning Bolt” of Jasta 19, 1917-18. Fuselage – natural wood, Wings – 5 colour lozenge with blue upper and lower rib tapes. Fuselage – natural wood. Wings – 5 colour lozenge with blue upper and lower rib tapes. Fuselage – natural wood, Wings – 5 colour lozenge with pink upper and lower rib tapes. Fuselage –green and pale gray mottle, Wings – green and mauve with “ripple” camouflage on the former colour and carrying light blue undersurfaces. Fuselage – green with silver-grey mottle, Wings – green and silver-grey mottle with light blue undersides. 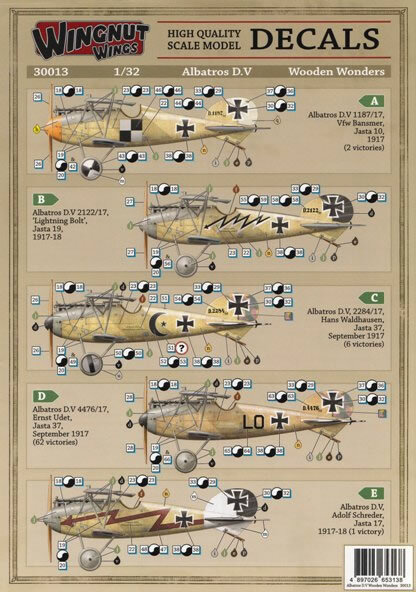 Albatros D.V, flown by Karl Haustein, of Jasta 37, 1917- 1918. Fuselage – silver-grey with (possibly) black stipple, Wings – overall silver-grey with (possibly) black stipple on the upper surfaces. Fuselage – green upper over grey, Wings – dark (green?) mottle over mauve and green upper surfaces with light blue undersides. Albatros D.V, flown by Claus von Waldow, of Jasta 15, March 1918. Fuselage – grey with dark green spots, Wings – sponged grey spots over the mauve and green upper surfaces with light blue undersides. 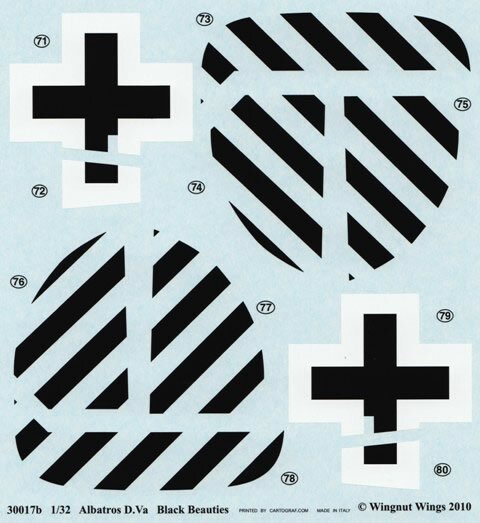 Fuselage – black and white bands, Wings – 5 colour lozenge with blue upper and lower rib tapes. Fuselage – green, Wings –upper surfaces green with light blue undersides. 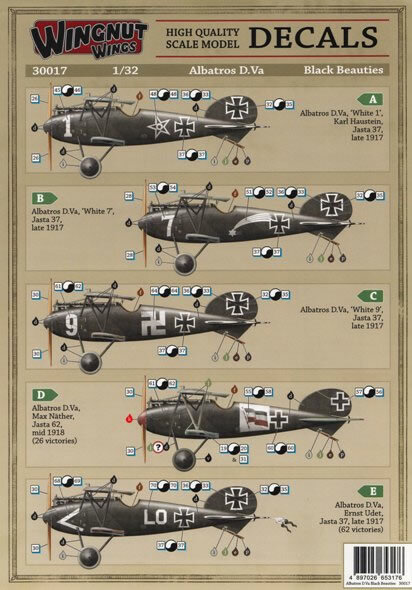 Albatros D.Va, “White 1”, flown by Karl Haustein of Jasta 37, late 1917. Fuselage – black, Wings – mauve and green upper surfaces with light blue undersides. Albatros D.Va, “White 7”, of Jasta 37, late 1917. Albatros D.Va, “White 9”, of Jasta 37, late 1917. Fuselage – black, Wings – 5 colour lozenge with pink upper and lower rib tapes. To keep costs down, 5-colour “lozenge” hasn’t been included in the package but is available separately as #32001 (upper), #32002 (lower) and #32005 (pink, blue and linen rib tapes).